Investors looking for income and value should take a closer look at these cheap stocks. While Mr. Market doesn't always play nice, sometimes he's so busy causing panic that he opens a window for opportunistic, level-headed investors. It's not easy to take action, though. You may know a great company is selling for a great price, but hesitation creeps in. You'll think things like "There must be a reason all those smart people on Wall Street are avoiding this stock," or "This high-yield dividend stock must have more risk attached than I think." Luckily, I'm here to tell you that there are companies that are actually incredibly cheap, offer above-average dividends, and are worth a closer look for your portfolio. Here's why The Dow Chemical Company (NYSE:DOW), Braskem (NYSE:BAK), and Mosaic (NYSE:MOS) fit the bill. 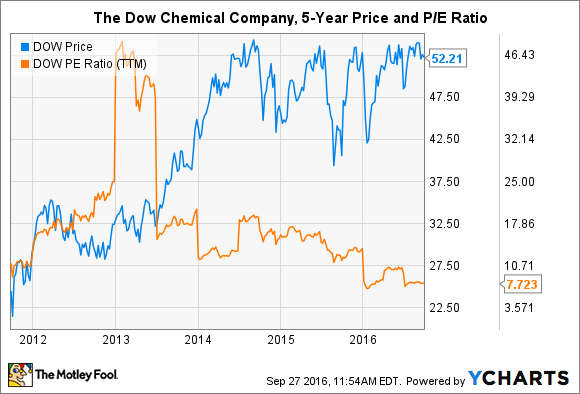 A global commodity glut has weighed heavily on many industries, especially chemical manufacturing, and The Dow Chemical Company is not excluded from those headwinds. While revenue fell 16% last year from 2014 levels due to depressed selling prices for commodity chemical products, net income jumped 104% in the same comparison period. That has lifted shares to all-time highs in 2016. There are several solid reasons for the improving bottom line. Margins have increased on higher utilization rates at upgraded facilities, which decreases the cost-per-unit sales metric. Cheaper inputs are now being used, thanks in part to a glut of certain chemical precursors coming from American shale plays. And The Dow Chemical Company has focused on higher-value opportunities in consumer products and performance materials, which are inherently higher-margin. The best part is, even with the stock at record highs, profits have expanded so quickly that the company is incredibly cheap. Historically cheap, actually. It's true that The Dow Chemical Company has tended to ebb and flow with the global economy, but it has come swarming back after each downturn. Simply put, it isn't going anywhere -- and receiving a 3.5% dividend to hold on forever isn't a bad deal for investors. Conventional wisdom says that investors have to make a choice between growth and high-yield dividend stocks. Brazilian chemical manufacturer Braskem proves that wrong. Really, really wrong. Like The Dow Chemical Company, Braskem is paddling against strong global headwinds. But it faces other unique challenges that have caused it to be abandoned by investors. For instance, it operates it Brazil, which is currently going through a historic recession. And one of its major suppliers -- Petrobras -- was at the center of the nationwide scandal that led to the impeachment of the country's president. While it hasn't been easy to be Braskem in the last several years, I think Mr. Market is unfairly dragging the company down. The company's total revenue dropped 37% last year compared to 2014 levels, but its net income managed to grow 182%. The reasons for each change are similar to those affecting the industry leader, but at a market value of just $5.3 billion, Brazil's leading chemical manufacturer has a lot more upside. The company pays a high-yield dividend of 5% but is still trading at a historically low value, sporting a P/E ratio under 7. Again, the company's profits have increased more quickly than its share price. Several trends support Braskem's continued profitable growth. It's the world leader in renewable chemical production and is investing in biomanufacturing systems that could enable even higher complexity and profits once optimized. It's also been working to decrease the debt on its balance sheet -- and currently has a better debt rating than its home country. 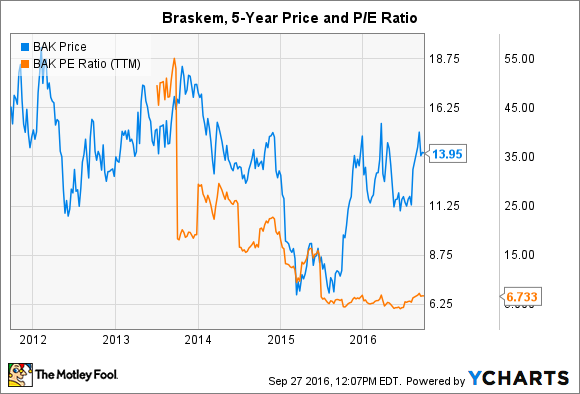 Long term, Braskem is one of my favorite buy-and-hold stocks on the market. Mosaic is one of the world's leading fertilizer producers. The problem is, that's been a terrible moniker in recent years, again due to the global commodity glut. Selling prices for the big three agricultural nutrients -- nitrogen, potash, and phosphate -- are at multiyear lows. And while companies are beginning to see clearer skies on the horizon, some markets won't begin recovering until 2018 or later. That means it will continue to be difficult for investors eyeing the high-yield dividends of fertilizer stocks. But Mosaic has a few things going for it. It's the only major fertilizer company that has not slashed its dividend, namely because it's also the most diversified. In addition to selling bulk fertilizers, it sells various farming solutions and services that have aided in insulating operations against recent volatility. While Mosaic's chart looks drastically different from those of the chemical companies presented above, you could argue that the stock is still relatively cheap, especially if you're patient enough to wait for the turnaround in the fertilizer market. Consider that net income was nearly twice as high in 2012 and 2013 -- when the nutrients market was booming -- as it was last year. That's not to say that things will ever be as good as they were then, but earning a 4.6% dividend yield while you wait for the fertilizer industry to correct itself is hardly painful. 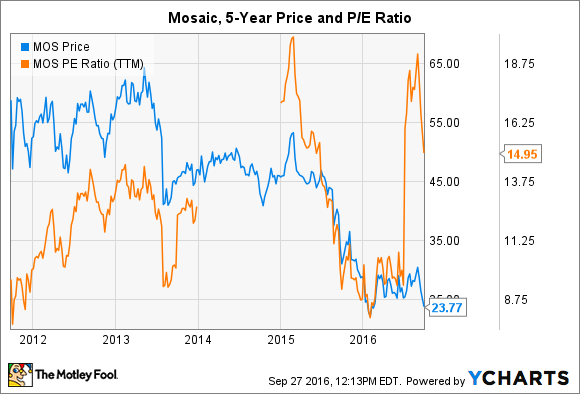 If that correction does occur, investors will be pleased to know that Mosaic's stock price in 2013 was more than double what it is now. Investors are being presented a gift with these three incredibly cheap high-yield dividend stocks. The Dow Chemical Company presents the most security; Braskem has the best combination of growth and yield; and Mosaic, although potentially lucrative, certainly presents the most risk in the group. I think Mr. Market is overlooking each company. You should consider taking a closer look.